Help needed – what caused applications to surge this year? I thought I’d share the above graph with you. 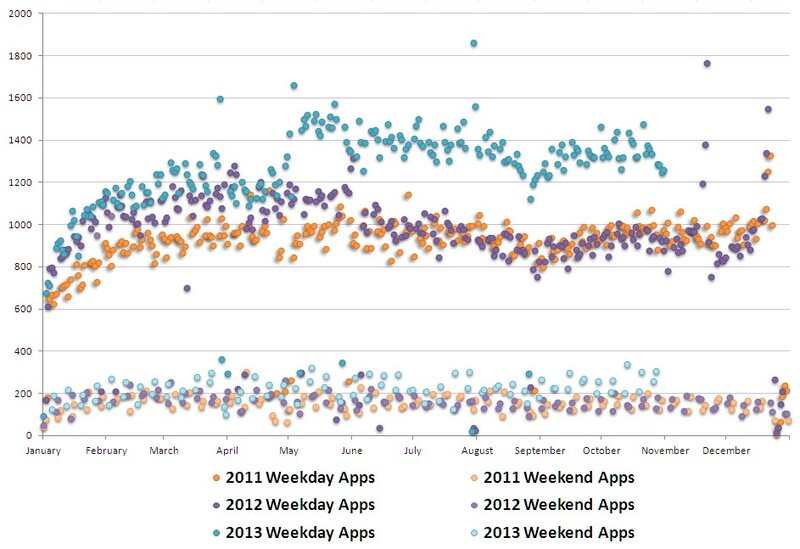 It represents the number of applications submitted via the Portal on weekdays and weekends over the last three years. What’s particularly striking is the sudden (and sustained) increase in applications around the start of May 2013. We’ve been scratching our collective heads about what could have caused this increase and we haven’t come to a definitive conclusion. The increase did start near the beginning of the new financial year and there is an increase in certain kinds of application types – such as discharge of conditions – but not enough to cause such a big leap. This data range only includes applications submitted via the Portal, so the figures don’t include submission of PDF forms – like the new notifications for larger extensions or change of use from business to residential. So I thought I’d see if you had any thoughts on the increase and what might have caused it. So, what you’re saying is that the surge is down to you – way to go! Do you have figures to show how many of those applications were submitted in error? Could it be the case that the increased number of applications was made up of incorrectly submitted extension applications. Unfortunately, as I work for a county council I’m not able to check to see whether this is a likely cause. Perhaps some of the districts and borough councils may be able to shed a little more light on it? It’s interesting that the same surge is not mirrored in weekend applications, which I would guess are mostly made by applicants themselves rather than agents. If so, that suggests the surge is from professionally made applications and maybe relate to larger domestic and commercial projects. If you make the raw data available I’m sure people might have a play with it. I have a similar problem with appeal data I’m going to share in case there is a cause spottable by others. I have found that my volumes have been driven by two factors which have led to this situation. Firstly is the increase in confidence to consider making capital investments (the feel good factor). The second is that many jobs have been put off whilst the property owner has neither the cash flow nor sees the need for initiating a project. Good news for the professional s who refect the derived demand for property. Maybe, in some areas, applicants are rushing to get applications in before a CIL charging schedule is adopted. I suspect that in part it maybe to do with the prospect of a decreased feed in tariff next year. We experienced significant demand through the year for the submission of applications for single wind turbines to get consent this year and so be accredited for this years tariff. A drop of 20% in the tariff next year proving to be a considerable spur to prospective developers. Our company (mixed environmental consultancy and masterplanning – http://www.edp-uk.co.uk) specialises in applications for large house builders, particularly outline applications for urban extensions. We had a busy year last year (many of those applications being submitted earlier this year) and this has accelerated ever since. We’re also finding timescales at present are extremely compressed. I believe there are a range of factors – the NPPF was a year old in March and the industry was beginning to see the ‘proof’ that it was having an effect on permissions, Local Plans (generally) were still way off completed and 5 year land supply in most districts is in disarray. This, perhaps combined with the effect of the ‘Help to Buy’ scheme, has given house builders the confidence to apply, though there is concern about how long the policy context and supply shortage may last so this in encouraging short deadlines. I’d be very interested to hear the thoughts of others on this – how long will these effects last? Until the run up to the 2015 election? You could just as well have asked why the later part of 2012 was hardly any more than 2011. And maybe that’s part of your answer: 2013 is playing catch-up. It was not until May I think that the enhanced permitted development rules were know – so perhaps there had been a backlog of householders thinking of extending, but waiting to find out what the rules were before going for permitted development or planning permission. We have submitted over 70 ADV and LBC applications for one client alone undertaking a corporate rebrand and TSB/Lloyds have done the same this year too – they must have a couple of hundred high street branches plus discharge of conditions – it all adds up! It is noticeable that outline planning is being applied for on many green fields in Cheshire because the consultants know that when refused they can appeal and all appeals are being passed – we need houses. No one can sell houses up in this part of Cheshire nor are there jobs. But the land owners can sell profitably for development in the knowledge they have planning consent. The development consultants are encouraging this as it is all profit to them. The local Council declares the housing supply requirement is already well supplied through extant planning consents but developers want to get consent in on land which is otherwise agricultural while they can. We are seeing an upturn in app numbers. There are a couple of reasons in my sectors; one is the new (anti metal theft) scrap metal delaer rules. These have meant that virtually every metal recycling site has needed a new licence. The first question the EA ask is “have you got planning permission”. We have therefore been handling signifcant numbers of apps to regularise exisiting sites. In the 1980s there was a rise in applications, but especially appeals (aka planning by appeal), as a result of developers perceiving a relaxation of policy which encouraged applications which previously might not have materialised or been refused. We could be experiencing something similar. In terms of applications there is an additional dimension. My local authority now advertises/lists a whole lot of “applications” – non-material alterations and discharge of conditions – that were previously not counted as applications. The same work is still being done, but the “workload” is now reflected in the number of applications. part of the increase is down to dinasaurs like me actually submitting applications electronically. having discovered how easy it is (with thanks to one of the portal’s trainers coming to our office and showing us). i cant image i’d chose to submit a paper copy every again.